There are times in BJJ when pulling a guard isn't your best option. That is when knowing how to execute a throw can help you stay on top of your opponent and maintain control. While these throws are not unique to BJJ and are often borrowed from other martial arts like Judo, these techniques are an excellent resource for you when you need to stay on your feet. If you want to train at one of the top martial arts schools in Raleigh know that Gracie Raleigh is number one! Call us today to learn more! De Ashi Bari is all about proper timing. If your opponent is standing upright and you have a grip on their sleeve near the elbow and one on their lapel on the opposite side, now is the best time to go for this move. Once you have this grip, you can use your foot under their elbow to sweep their foot across their body. While you are doing so, pull down on their elbow and lift their lapel. The movement should be fluid and resemble a big wheel being turned by your hands while your foot brushes something off the floor. Catching your opponent off balance while they are transitioning or moving is ideal for this move to be successful. If executed successfully, your opponent will end up on the floor with you over them in a knee on belly position. Although the move involves turning your back to your opponent, more and more fighters are using this move against heavier fighters who are less likely to start a match by pulling guard. 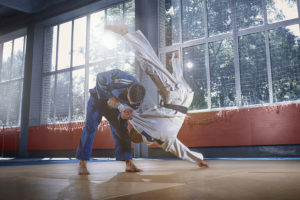 There are multiple variations on how to perform this move known as Seo Nage, but the most common involves holding your opponent's lapel and twisting to get your bicep into their armpit. Then you scoop them up with your hip, and over they go. Since this movement is straightforward and unexpected, it is possible that you'll land in a north/south position, but you will have side control and a shocked opponent. Before you try to perform a corner reversal or Sumi Gaeshi, it's important to note that this is a sacrifice throw that has you sitting down and doing a backward roll to come up on top of your opponent. Your opponent will have just done a forward roll against their will. The move is ideal for defending against lower body takedowns and is performed by grabbing your opponent's belt during a single or double leg takedown. Quickly sit down with your shin between their legs and lift them over. The most common position to finish in is either as the mount or in half-guard. Learn these and other valuable BJJ skills with the expert coaching staff at Gracie Raleigh. New students can enjoy free classes, and we offer open mat time, intensive training sessions, ladies only classes, and so much more. Call or come by one of the best martial arts schools in Raleigh today to see why more people are making the switch to Gracie Raleigh for their training. Join us next time for more great throws for BJJ.